After the last time I made my stationery confessions, I discovered that there is a whole world of stationery-related blogs to enjoy. Who knew? Yes, there are people who give chin-scratchingly serious consideration to choosing the latest insert for their Filofax, and who know that their next choice of notebook very much merits a 500 word blog post. I like those people a lot. To support the stationery nerd cause, I am breeding a little tribe of pen-heads. My kids are genuinely pleased that we’re going to take a weekend trip out to a big branch of Staples to look at office chairs. I am hoping it will be like the Disneyland of stationery and not just a big warehouse full of brown envelopes. Back at the homestead, phase two of our (dream job) ambassadorial duties for Cross Pens has kicked in. This involves them sending us some of their latest pens, and us swooning over them. I know, it’s a tough life. 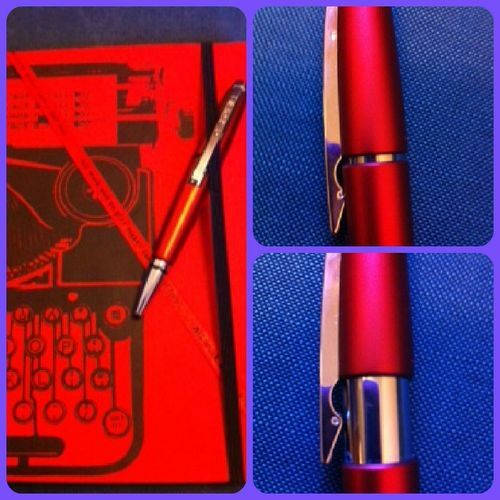 This time Cross sent us two new pens – the Limited Edition Disney set and a red Edge pen. 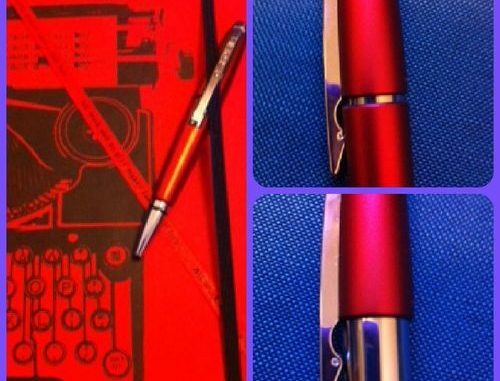 The Edge pen is a good one for a gadget fans because you have to click it out to write, then click back in to close. The pull out action means you’re good to go with one hand. It’s proven most popular with the menfolk of our house, meaning that in the interests of equality I have reclaimed it for myself. It retails at around £40 but feels a lot more expensive. The gel ink writes incredibly smoothly, so it feels like a cross between a rollerball and a fountain pen. The Disney set comes with teeny interchangeable charms. I have mixed feelings about these because whilst they do look undeniably cute, they also look like they would be slightly annoying when you’re writing. But as it turns out they don’t get in the way at all, I didn’t notice them at all when writing. There are various Disney pens in this range and this being the Cinderella version its accessories are a weeny little shoe, crown and pumpkin carriage. 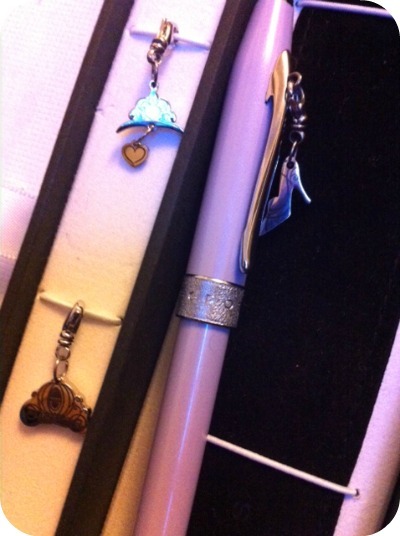 It’s a very pretty pale lavender colour ballpoint, finished in lacquer and chrome, retailing around £65. And because I now know that some people really care about this stuff, I have investigated the Filofax-friendliness of the pens. The down side of being a Cross pen ambassador is that it has totally spoiled me for ordinary biros. Picking up one of those is like handling a dead twig, and I tend to drop them in disgust and go looking for one of my decent pens instead. In a bout of Derren Brown-style mind melding, I have convinced the kids that being granted the use of Mummy’s Good Pen is a treat beyond measure. Not quite as good as a trip to the big Staples but, y’know, up there. And when granted this favour, my children have been trying extra hard with their handwriting. Using a decent pen motivates them to try harder. This has in turn led to better marks at achool. One day they will be running the world and we can say that it all started with a pen. Disclosure: I was sent these pens free of charge by Cross in exchange for feedback via email. I was not asked to blog about them but I chose to do so because I think they’re pretty cool and worth talking about.